England manager Roy Hodgson has defended Wales counterpart Chris Coleman in his dispute with Arsenal boss Arsene Wenger. 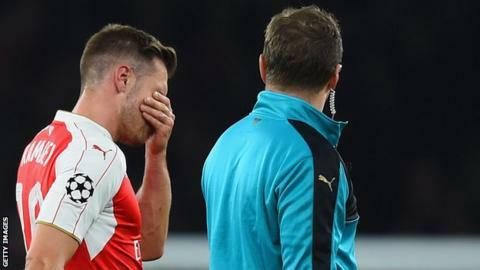 Coleman accused Wenger of a "cheap shot" after the Frenchman suggested Aaron Ramsey's hamstring injury was caused by playing for Wales. Ramsey came off in Arsenal's win over Bayern Munich, three days after playing 90 minutes at Watford on 17 October. "What Chris Coleman has said, he must stand for that," said Hodgson. "He had his opinion about the comments Arsene made and he's entitled to air those opinions and say what he thinks about it. "On a general basis I do believe that when players return from international duty fit, if they then get injured in their club game, I do not know that you can put that down specifically to what's gone on in an international game." Wenger had criticised Coleman for selecting midfielder Ramsey in Wales' final Euro 2016 qualifier against Andorra. The 24-year-old's injury means he will miss Wales' friendly against Netherlands on 13 November. "I sympathise with Arsene because to lose three players like he did, one does tend to look for every possible reason that there could be," added Hodgson. "All we can do really is to make certain that we do the best for England, or Wales in his [Coleman's] case, and then the club manager must do the best for his team. "When it comes to resting players, I don't think it can be completely incumbent upon national teams to do that because there's much more opportunity for club teams to rest their players than there are for international managers to rest their players. "You do not have that many [international] games and the games are very important ones."